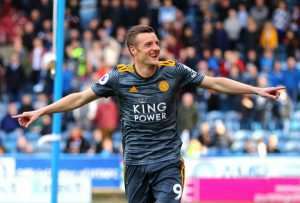 Leicester breezed past bottom side Huddersfield to make it four Premier League wins on the bounce under Brendan Rodgers. Burnley secured a crucial three points on the road at Bournemouth to give Sean Dyche's side some relegation breathing space. Youri Tielemans fired Leicester into a half-time lead and Vardy added their second before Huddersfield hit back through Aaron Mooy's penalty. Milivojevic's 81st-minute spot-kick sealed in 1-0 away win in a tight affair at St James' Park on a day when victory for either side was likely to effectively end their fears of being dragged into the relegation battle. However, the Magpies' leading scorer Salomon Rondon had earlier passed up a series of golden opportunities to put his side ahead in front of a crowd of 51,926, and the wait to secure their top-flight status goes on.